HOD in dogs: HOD is the abbreviation for Hypertrophic Osteodystrophy, which is just one of several developmental orthopedic diseases or issues affecting dogs in our modern times, which is likely not an issue affecting dogs/wolves living in the wild that are not subject to man-made diets. HOD is essentially referring to swollen joints in the dog; but, the cause of the swollen joints is tied to irregular bone growth problems. There are four different situations where swollen joints in dogs may get diagnosed as, or ‘blamed on’ HOD. Incorrect or unbalanced nutrition is the normal causative factor in an actual case of HOD – where long-bone development is out of kilter, and one result is the swollen, painful joints that can cause differing degrees of disability in the young dog. However, there are three other situations/cases, that can create the HOD like symptoms and the painful swollen joints. Those 3 include (1) Septicemia, (2) reactions to vaccines, or (3) allergic reaction to antibiotics (various forms of fungi). All these are issues which can result in swollen joint problems with associated pain and immobility, thereby able to mimic an actual ‘developmental’ form of HOD. Therefore, whenever HOD is indicated, it may not be a true case of HOD, where the irregular bone growth associated with HOD is involved. This type of ailment is generally assumed to be a large or giant breed issue; though dogs that don’t fit that category may not be automatically immune to such growth irregularity. History of this type of ailment shows that typically, between the ages of 3 – 6 months of age, is the critical developmental period for the large/giant breed puppies where they may be susceptible to possible irregularities that may pose an HOD threat. This is the time in which HOD is generally seen and is the result of fast, uneven growth patterns. Veterinarians see this developmental disease expressed in the joints – where they become inflamed and swollen in the growth plates of the front and back legs. In the later stages of HOD, dogs are unable to walk or even stand without assistance. NZYMES® Super-food protein is an ideal supplement to help support the nutritional needs of dogs with potential for such growth issues, as well as dogs already displaying bone growth issues or showing the painful-joints symptoms indicative of a HOD condition. We have seen dozens of cases where one simple daily supplement can help the body turn things in the right direction and yield the necessary growth patterns required for a normal, happy, and healthy large-breed dog. Years of study of the bone growth in large breed dogs have shown the effectiveness of the NZYMES® in the realm of promoting the body’s ability to stabilize growth related to shoulder and hip height, and balance. 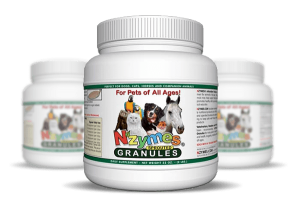 The use of NZYMES Antioxidant Treats or Granules, along with a change in diet and monitoring the amount being fed, can provide significant help with the challenge of reversing the growth-issues causing HOD in a young puppy. HOD, as tied to Nutritional issues, deficiencies, or incorrect feed regiments, is most often caused by poor quality diets, or over supplementation and/or over consumption of calories versus the amount of exercise the puppy gets on a daily basis; in other words, intake vs. output. 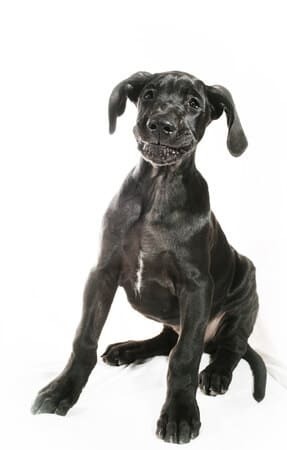 Studies by Linda Arndt, the Great-Dane-Lady, show that large-breed puppies are meant to be, and need to be lean during their first 2 years of growth, but are often over-fed and thus such problems develop. Feeding a Holistic or Super Premium level dog food of moderate protein, 22-24%, and moderate fat, 12-15%, with quality minerals, fed in moderate amounts, will also provide significant help in avoiding HOD issues in growing pups – in that larger-breed category. For deeper information on preventing HOD, you can refer to the Blackwatch Feed Program for Large/Giant Breed Puppies and for correcting a HOD problem see the Blackwatch Feed Program for HOD Puppies and A Guide To Recognizing Bone Diseases at the Great Dane Lady website.